Magazine Photo Shoot for "Bride To Be" Magazine. Originally uploaded by Le Cupcake - Australia. 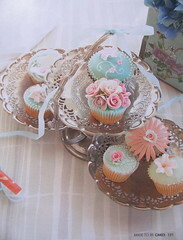 "Le Cupcake's" cupcakes in the "Bride To Be" cake magazine for this quater. (Full page photo). New Idea Magazine Photo Shoot! 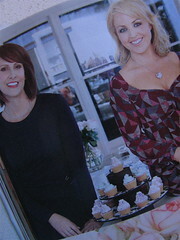 Close up of cupcake photo in this months New Idea Magazine. 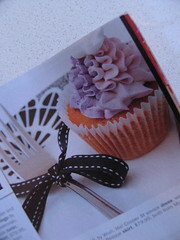 Cupcakes in the New Idea magazine in May, by "Le Cupcake". Delicious vanilla heaven cupcakes with meringue buttercream icing & hand made tropical flower, on a custom made 4 tiered stand. 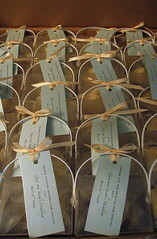 Gorgeous wedding bonbonnieres with antique blue shimmer tags & pretty cream ribbon. 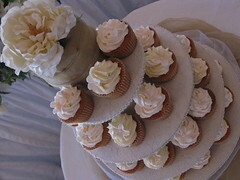 Each bonbonniere has a delicious cupcake inside for your guest! These can be used as bonbonnieres for the wedding tables (some on your wedding cake tiered stand & the rest as bonbonnieres) saving you money, or for your guests to take home. View more at oldest posts...click on "older posts" at thebottom of thepage, then click again.....etc.